I'm not really sure how people with kids did holiday shopping before the internet but I am very glad to not be one of those people. Needless to say we have been getting lots of packages at our house lately. With lots of packages comes lots of bubble wrap, so yesterday we used our bubble wrap to make our own wrapping paper. I started by rolling out a long piece of paper onto our table, we buy rolls for just a few dollars from Ikea and use them for everything. I then poured some washable paint onto plates and gave the Bee a roller and a bunch of pieces of bubble wrap. We have actually done this before so she knew to roll the paint onto the bubble wraps and print it paint side down onto the paper. 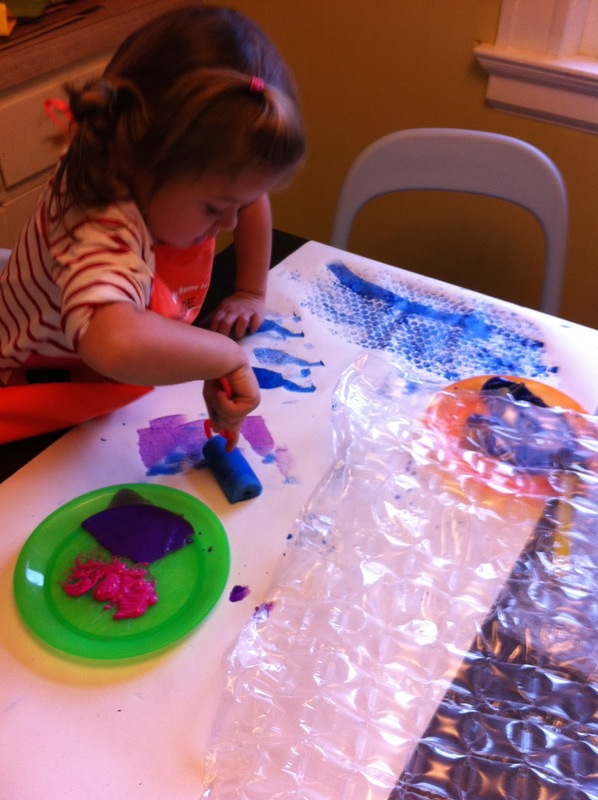 She printed the bubble wrap a bunch of times on the paper as well as painting the paper with her roller. We are hoping to print more paper later this week and use the paper to wrap some of our holiday presents! I also did that when I was about 6 years old. I really love bubble wrap that time. Using bubble wrap for arts would also be as great as popping them!